This is essentially a special edition Vimto ring doughnut, which is out until January, but with a flat sugar icing eye covering the centre. It's reminiscent of the huge many-armed purple one-eyed monsters from the old video games that floated around a room trying to kill you with magic attacks and a multitude of tickle sticks (may have made that bit up). 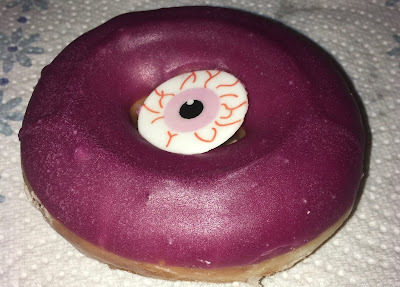 Okay, so this Vimto Scary Eye Doughnut doesn't have many arms, which is probably not a bad thing as it would be pretty difficult to get it in your mouth, especially if it was trying to stop you from eating it at the time (or tickle you)! I ate the scary icing eye first. 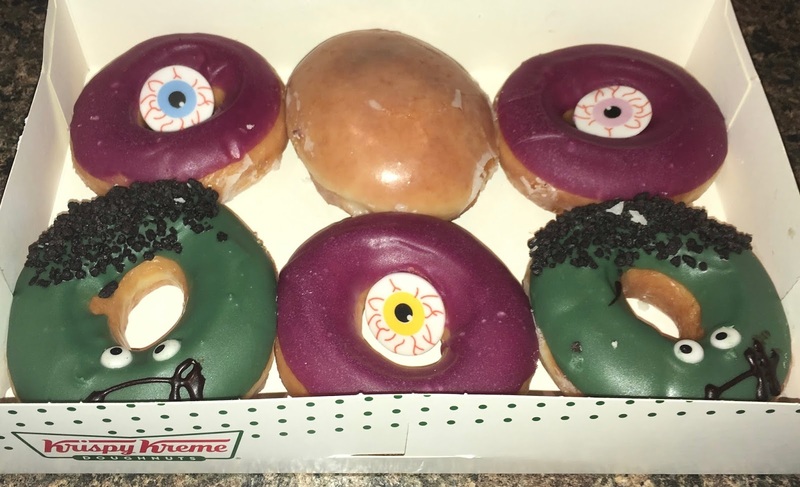 The purple doughnut wasn't so scary without it. The doughnut had purple coloured Vimto flavoured icing, which did taste exactly like Vimto. It was really tasty and very fruity. It was the favourite of the two for everyone in the room, especially when all the scary eyes had been eaten and weren't staring at us anymore! Happy Halloween… here's hoping lots of things go bump in the night, well, until you go to bed and have sweet dreams! Bwhuh… hah… hah… haaaaaah! These beautifully decorated cupcakes were found in Waitrose. The name of the brand Fiona Cairns seemed familiar but I could quite think why. A quick Google showed that this is the maker who made the cake for the Duke and Duchess of Cambridge’s royal wedding. Well, this is Waitrose! 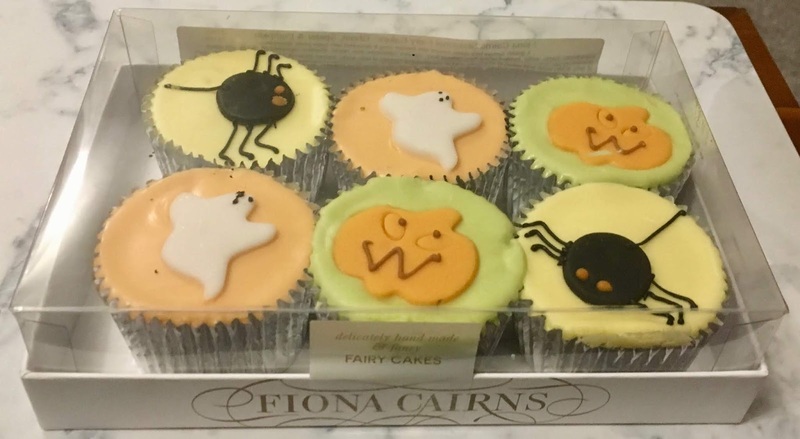 These cakes are not as posh as a wedding cake but their cute Halloween designs did catch our eye. There are three designs in the box, that of a ghost (which does have a little added sparkle), a bright pumpkin and a freaky spider. I hate spiders and for the record no amount of telling me my fear is irrational will help, show me a spider and I’ll scream. I miss the bravery of my previous line manager at work who had no fear and used to clear them out of the office for me! She didn’t even tease me too much. 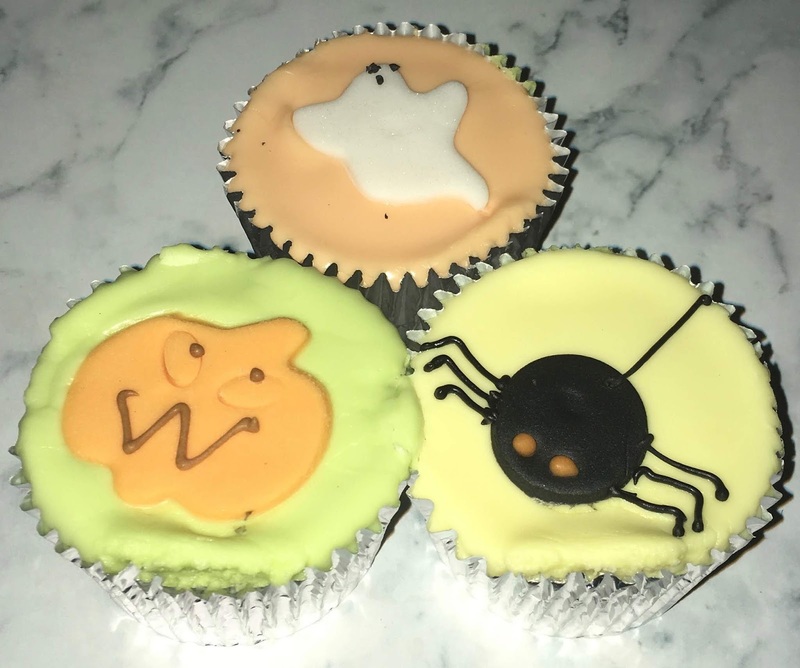 Anyway, that aside I can cope with an icing spider… just about. The cakes have surprisingly sticky icing when they are unpeeled from their cupcake cases, and some finger licking became inevitable. The sponge was lovely and moist, and the soft icing was wonderfully sweet. These were a proper treat for Halloween and their hand finished spooky decorations really made them stand out. Happy Halloween everyone, hoping you all get a few treats. We were doing our weekly shop and spotted this fantastic looking cake on the shelf. 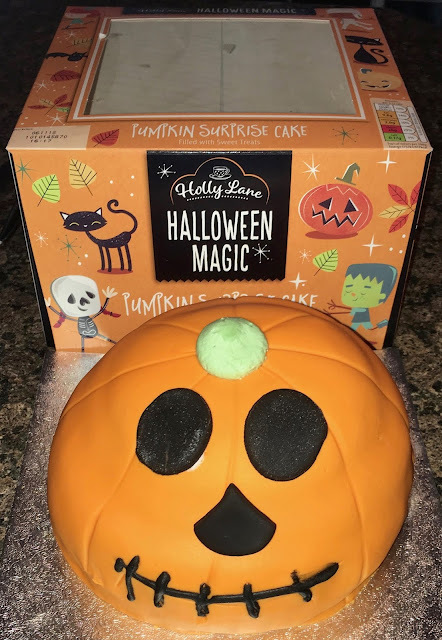 It is a Halloween Magic Pumpkin Surprise Cake, and not only looks fantastic, it has a aforementioned surprise filling too. As we were sharing a seasonal lunch with friends and family we picked one up to try out. I didn’t need much of an excuse, or any to be fair, the second I saw it I knew this cake was coming home with us! After our lunch we decided to cut in, it felt like a shame as it is such a fine looking pumpkin cake. The lines on the bright pumpkin helped mark slices, and inside was revealed a lovely vanilla sponge layered with buttercream and jam, and the best bit was the fantastic spilling out of all the candy coated chocolate drops, this couldn’t help but put a smile on your face and it was a complete crowd pleaser. The cake itself was wonderfully moist and sweet, and the fruity jam added a nice balance to the flavour. The icing wasn’t too thick, but it was lovely and sweet too and everyone enjoyed the cake. I was really pleased this cake wasn’t just all about the design and it delivered fantastic flavour too. I enjoyed munching on the chocolate drops too afterwards. 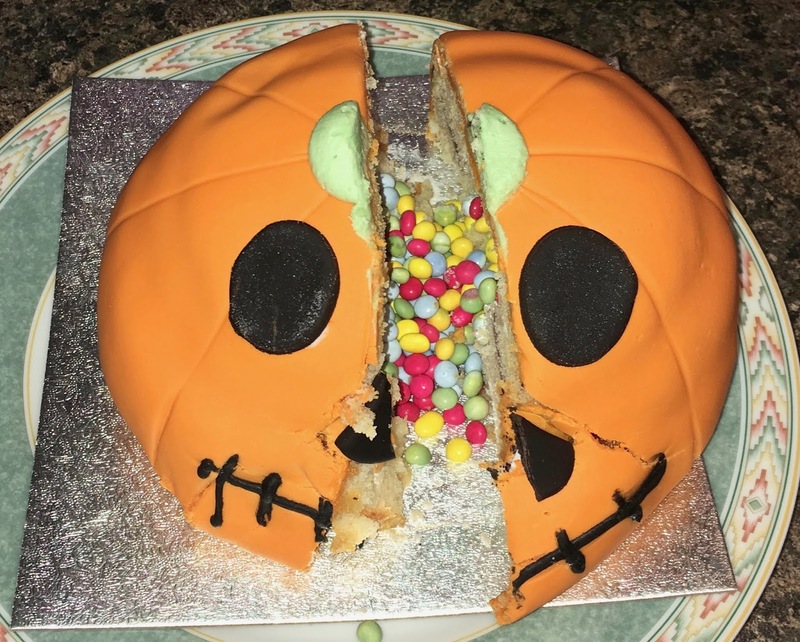 I think if you are looking for a cake as a treat this Halloween, you can’t go wrong with this Halloween Magic Pumpkin Surprise Cake. It's Halloween and this means all the blogs make a special effort! For me the special effort was going round to my Sister's house. All of the pictures today were taken using all the wonderful Halloween stuff set up for my sister's Instagram! You should all go follow her and double her followers because she doesn't know I'm mentioning it and it would freak her out! While there were lots of ghoulish treats on offer today we are talking about this - zero sugar Fanta Blood Orange. It's £2 for 6 because the bottles are special and interesting. This one does have a snapchat thing which once you've figured it out gives you this! It looks quite good in motion on the camera, but in stills it just looks a bit messy. Happy Haloween! Oh great! I had to wrestle the same drunken pumpkin for my last cider blog, and now he has a friend! It was quite a wrestling match to wrench this beer off them too. I managed to get this beer off them just in time for a 'Treat' rather than a 'Trick'. 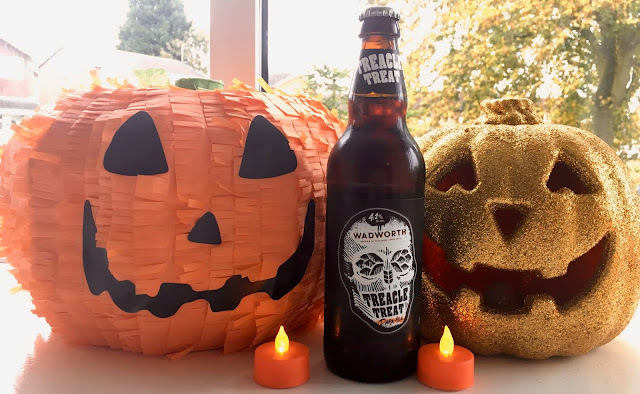 This Treacle Treat from the Wadworth Brewery, in Wiltshire, is a dark ale with herbal hops and made with black treacle. I like the skull with hop eyes and barley nose on the front of the bottle. Described as an "apocalyptic Autumn ale", at 4.2% volume this Treacle Treat sounds anything but a dastardly Trick! However, on opening the bottle there was a cheeky fizz like a child ready to play a practical joke. Though there was the unmistakable luscious smell of richly roasted chocolate malt, with an edge of coffee in the aroma, and then a not so subtle sweetness at the back of the smell from the black treacle. On pouring this dark brown ale has something of the night about its colour. It has a complex taste to it too. Both brown malt and chocolate malt seem to battle for supremacy throughout the flavour. There is the taste of burnt toast from the brown malt coupled with the chocolate and coffee flavours from the roasted chocolate malt. Dancing devilishly around these malty flavours springs the bitterness from the tricksy herbal hops, which is mixed with the sweetness from the black treacle complementing the chocolate flavour in the beer. All these malty, hoppy, sweet treacle flavours waltz off together into the aftertaste. Mmm… this Treacle Treat is a dark treat and not for the faint hearted. There is also a warmness from this concoction of flavours. On any dark stormy night this beer would be a beacon on the grey cloudy horizon, not so much like a haunted house, but a warm place by the fire that friends can recount the scariest of their favourite ghost stories. 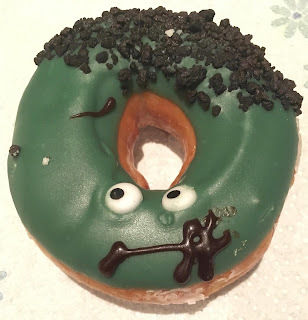 There has been less new products this year for Halloween than I have seen before but I’ve still been able to find a few things that are new to me and have made me smile. 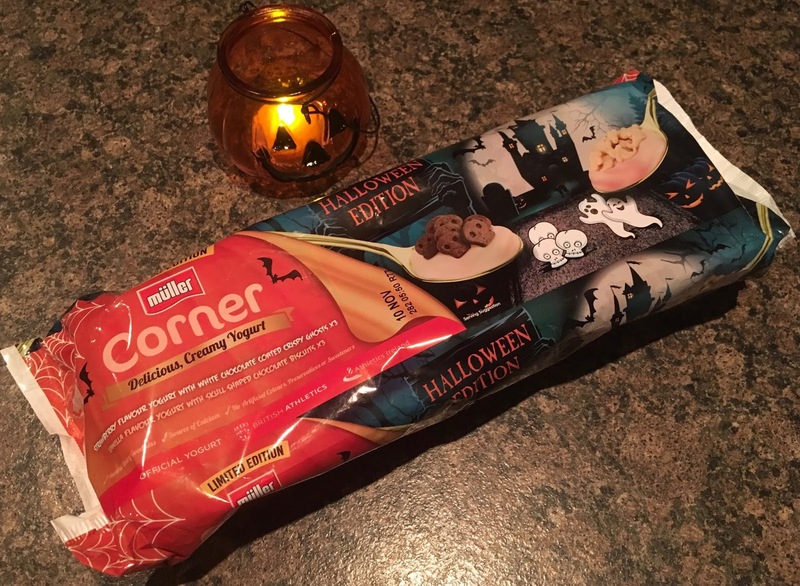 This is in that category and it is the new Halloween Edition Muller Corner Yoghurts. They are in a multipack with six corner yoghurts inside, three of each of the two flavours. The yoghurt here was the usual sweet, fruity and smooth strawberry Muller yoghurt. The ghosts were small but crispy and the white chocolate added a nice level of sweetness. The ghosts were a little rough in design, but you could get the idea. The yoghurt section was very creamy, but the biscuits had a quite a deep cocoa taste which worked well with them. The main flavour was still the vanilla but the extra chocolate was a nice addition. I thought the skulls were particularly well shaped and did look the part. I like the effort of the Muller Halloween yoghurts, the base yoghurt is simple enough but the decorated biscuits made it, and added a nice twist to the twin pots. These might be the perfect fuel to set you up for Trick and Treating, but hopefully they leave a little room for any candy you might collect. There are few things less appetising than bad meat. Dried bad meat is possibly one of them - and as the majority of jerky style things I've tried over the years have been from this category I've been very wary of trying more. I was on a wander around Asda and taking pictures of all the snack meat that was hanging from the shelves - usually in weird places. Luxury meat bag or savoury crackers? Possibly both - it is 100% succulent which is a claim that makes no sense. Gluten free meat parcel or messed with beans? Beans review to follow. Now that badly described Protein is a thing there is certainly a market for meat in a bag. I just didn't think I was brave enough to try more - until I spotted this. Now I really have no excuse. This is the brand that has been more appealing out of the options, and now it's Vegan. I mean in theory it's vegan - it's made out of vegan friendly things - but its really not designed to be eaten by life-long meat avoiding vegans. Even the bag avoids telling you it's vegan. Mmmm - air dried strips of vegetable protein! Just like Jack Bauer this only lasts 24 hours so you better be prepared to chew a lot or to share at least. None of the people I shared this with (all carnivores - one halal) liked it enough to finish or ask for more. And looking at the actual item you can kind of see why. But... Like sun-dried tomatoes this is actually quite appealing. Yeah - your going to be chewing for a bit before the flavour is unleashed but this is probably the nicest jerky I've had - in fact because it's vegan and you didn't have to kill cows it's jerky without being a jerk. maybe. who knows how kind they are to the flavourings they used. Looking back up it's all seemingly straight forwards - good quality vegan protein but flavoured and dried in salty, umami goodness. I'm thinking I'd buy this again. It may even make a nice freaky stocking stuffer. probably not one for the trick or treaters but you'd get double horror as it looks a bit meaty and turns out to be vegan. On opening the packet there was a smoky sweet barbecue smell to the millions (possibly) of tiny orange twisted shaped corn snacks inside. WARNING: Choking hazard!?! At least there's something scary about this blog. 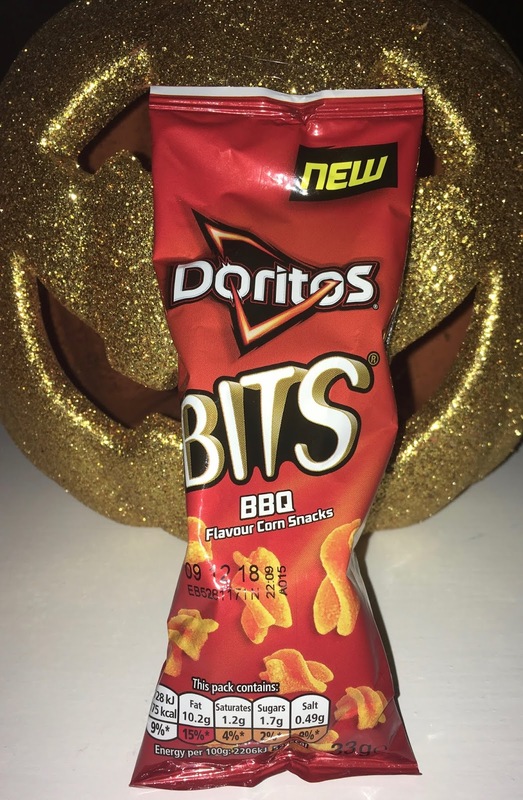 I wouldn't eat these Doritos BBQ Bits running down a dark alleyway in the middle of the night whilst being chased by a vampire! On tipping a gob-full of these corn snacks into my mouth there is smokiness to start with in their flavour, followed by a little sticky sweet barbecue sauce, and a small heap of paprika, and then the corn aftertaste dully shines through. These Doritos BBQ Bits are pretty tasty. I'd give them a thumbs up, especially for snacks on a gaming night for tipping in a mouthful between Battle Royale or racing your friends. 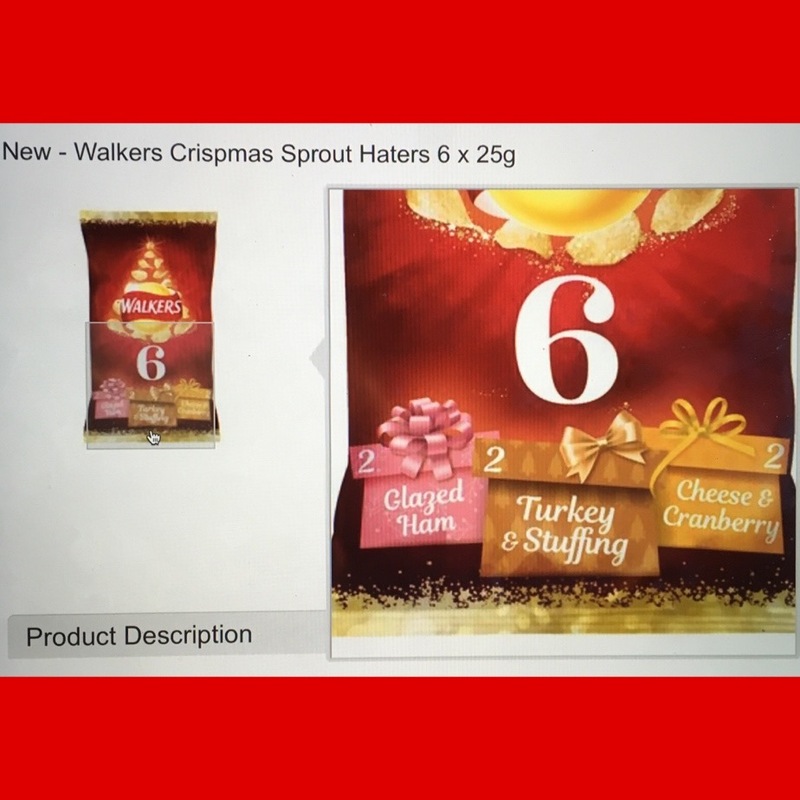 The 33g packet contains 175 calories, 1.2g of fat, 1.7g of sugar and 0.49g of salt. For ingredients please see photograph. There are a lot of fancy new products trickling on to the shelves for Christmas, and I have managed to pick up a few items for future review. In amongst the new adventurous items I spotted these new biscuits called Galaxy Chocolate Rounds. They don’t have any fancy weird flavour combinations but sometimes simple works, and Galaxy chocolate is always silky smooth so I thought I would give them a go. Inside the packet the biscuits are stacked in piles of two, so there were notables less than I had hoped for in the box. I think this type of plastic tray covered in an outer wrap always seems to make you think there will be more than there actually are. I broke one of the biscuits in half and could see small golden yellow bits inside the biscuit, but I couldn’t quite work out what they were. I checked the packet again and it says the biscuits are just shortcake, no mention of an additional ingredient. I decided to give them a try. The biscuit part is lovely and buttery, so again I thought maybe the yellow bits were butter, but I’ve not seen that in a biscuit before. 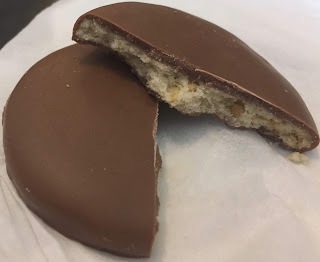 The chocolate was quite generous and the Galaxy flavour was spot on, sweet and very smooth, it worked with the buttery biscuit too. As I said sometime simple just works, and these were spot on. I just wish there were more in the pack. When out and about in England it's fun to try all the little cafes and eateries that have cropped up. Some like Devo-Teas are very much independent and nice cosy places to hide away. Others like the Little Dessert Shop are chains, but well meaning ones with a nice variety on offer and act as a noisy, bright place for other people to gravitate towards. I prefer my restaurants indy and snug, but for a massive sugar hit you can't really go wrong here. 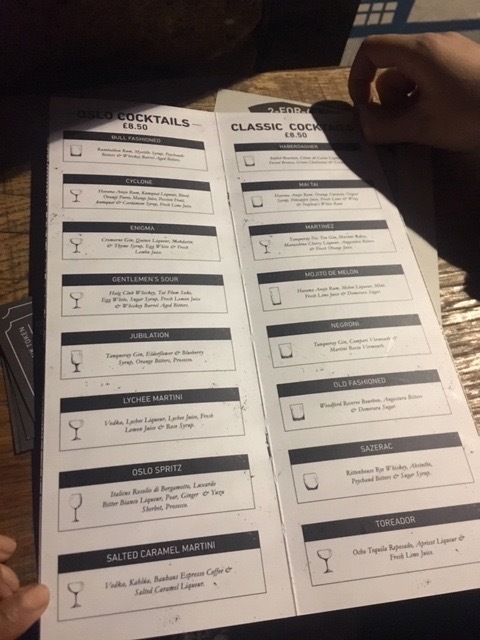 And lots of fabulous options that you can add too if you choose. Sam had this - it's exploded Maltesers on a waffle. It was very nice. It was all very nice though, and the addition of both cream and ice-cream meant that you could get a variety of textures and bites. I did like the little arty wafers. I mean - I know those are easy enough to do, but it does add flair. And it's gooey all the way to the last bite. I'm really glad I got a glass of tap-water on the side - it's quite sweet!! We basically had this as an afternoon treat and then skipped dinner. Yum! May I be the first of us to welcome you to the spooky Halloween season (which is about two weeks of blogging). Bwuh hah hah haaaa! 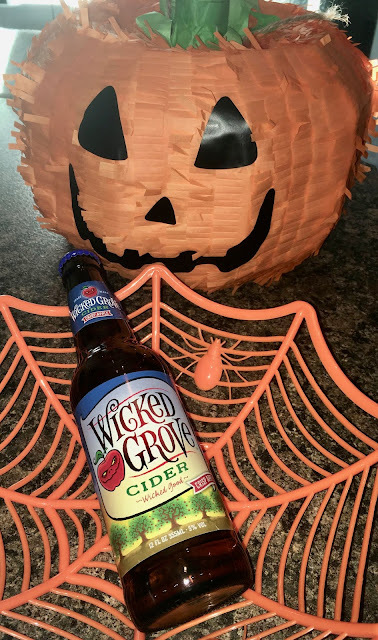 I seriously had to wrestle an alcoholic pumpkin for this Wicked Grove Cider. He was really quite strong! It harkens from an ancient grove hidden in the Vermont countryside which was full of bewitched apple trees. The apples from the grove were said to have produced the first Wicked Grove Cider, of which this beverage is a recreation. The brewer may have lost the grove to time or the trees themselves were uprooted and pulled through a portal into an enchanted realm! I'll leave you to ponder that while I find a bottle opener whilst looking out for an inebriated pumpkin. There was a sweetness from the cider apples on opening the bottle, with sourness at the back of the aroma. I'm not sure how they lightly carbonated ancient Wicked Grove Cider, much the same way as someone invented the jacuzzi whilst they bathed in a nearby duck pond perhaps? Having said that, this is a very pleasant cider. There is sweetness to start with as the bubbles tickled my tastebuds, quickly followed by a tartness that follows into the slightly sour apple aftertaste. Much like the feeling of being followed on a dark windy night through a Wicked Grove… possibly by an angry farmer who doesn't like trespassers, or more likely by a drunken pumpkin! Chilli it is a difficult thing, some people love it, some people hate and most people under or over estimate their tolerance. I describe myself as someone who likes spice, but I’m not a chilli addict, and if it gets too hot I’m not interested. I think what I’m trying to say here is that chillis is subjective, and as we saw on The Apprentice this week (hot sauce and chocolate doughnuts) it doesn’t always work combined with sweet things. 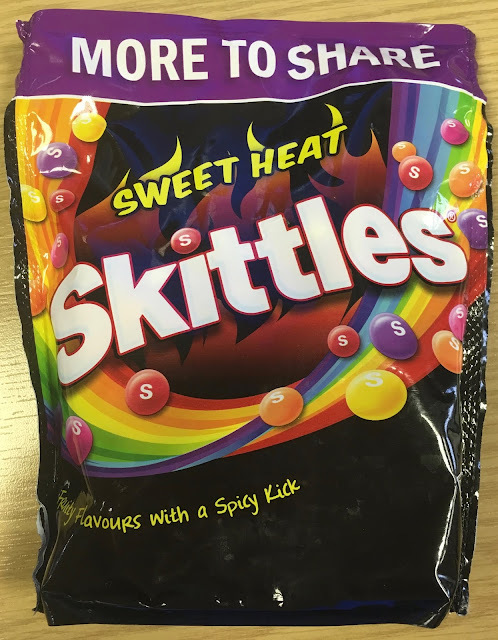 Skittles have gone for it anyway and released Sweet Heat Skittles, Skittles with sweet fruity flavours and a spot of chilli. Scorchin Pineapple - This was sweet and hot from the beginning, the tropical flavour left my tongue buzzing. 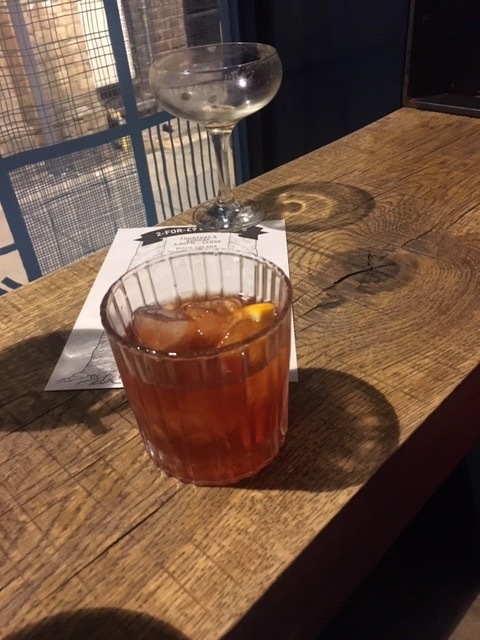 Fiery Watermelon - This Skittle tasted like it was going to be refreshing but the chilli built up and caught me at the back of my throat. Sizzlin Strawberry - This one was I think the softest, and I liked them the most, sweet strawberry with a nice warmth. Lemon Spark - I think these were the hottest, or the lemon flavour wasn’t quite sweet enough to soften it. The lemon was sharp, the spice warm, it was quit a sensation. Piccante Passion Fruit - These were hot too, or perhaps I was getting build up from trying the others first, but the passion fruit was pleasingly fruity. It was just a bit warm. 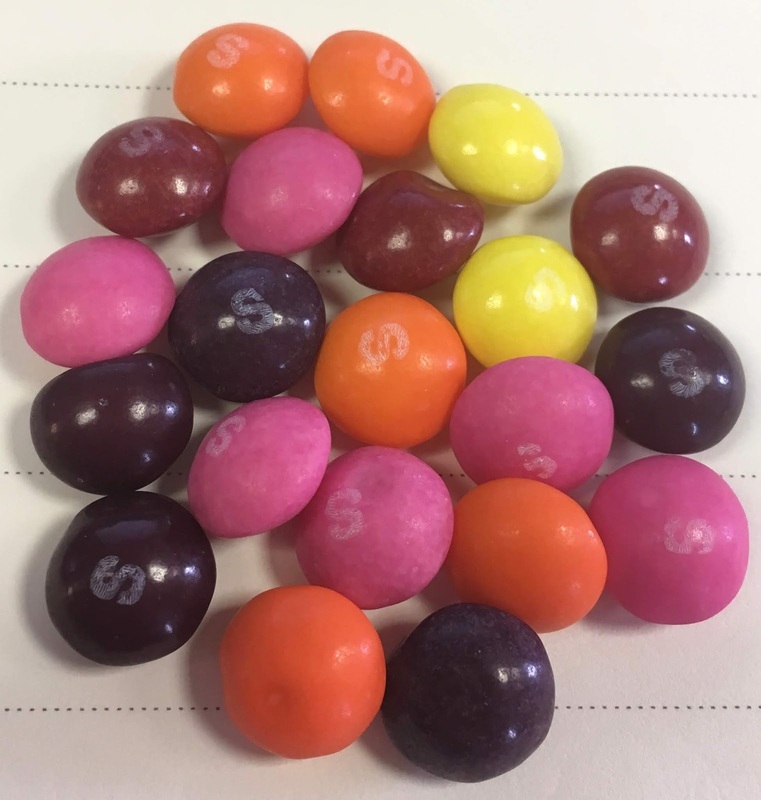 A chilli loving friend tried these Skittles and said the spice was barely noticeable. A colleague tried eating a few and then suffered the chilli as his work phone went off. I liked them, the Sweet Heat Skittles were hot and fun. Grab a handful of them and see how you go! Frequently people go on holiday and bring us back exotic versions of everyday treats - even if they intended to buy the regular edition like with this crunchy coconut Toblerone! And has the new increased air-gap which people were annoyed about briefly! You can just about see the coconut and it adds a little extra crunch between the chew of the nougat and the softness of the chocolate. It's times like these that I realise that I can be pretty ignorant. I do love ginger ale, and the nose hair ticklier (yes, I know that's not a word) the better. However, I actually presumed that the terms ginger ale and ginger beer were interchangeable. A little bit like beer and ale. Although ale and lager are different due to their types of yeast and their fermentation process, which is 'top' for ale and 'bottom' for lager. Ginger ale and ginger beer to me were the same. I guess I've never given it much thought, just popped the can open and drunk it. I have had alcoholic ginger beer in the past though. I've even blogged about a few. The clue is in the title… Ginger beer is fermented (brewed like beer! ), whereas ginger ale is not, it's ginger flavoured carbonated water. Who'd have (good ole Urban Dictionary) 'thunk' it? These two bottles from Fever Tree made me think again. Now to the drinks themselves… The Premium Ginger Ale is a slightly coppery colour. 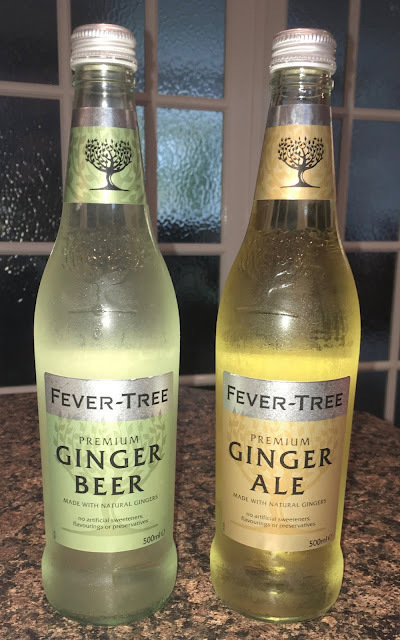 The blurb on the back of the label states that there is natural ginger in this ginger ale and also botanical flavours for a traditional ginger ale taste. I'm used to mass produced ginger ale, big on fizz and even bigger on nose hair tickling flavour. On opening the 500ml glass bottle this Premium Ginger Ale was definitely big on fizz. There was a mild smell of ginger and it didn't make me sneeze like my regular favourite brand if I suddenly masochistically sniff it. On taste this Premium Ginger Ale is very easy to drink. The botanicals they mention taste a little like those within a traditional cola, and the natural ginger is a little understated. It did tickle my nose slightly, but not to sneezing stage… not that the label promised it would provide super ginger heat like some other drinks do. If you prefer a more subtle ginger ale than this is definitely for you. 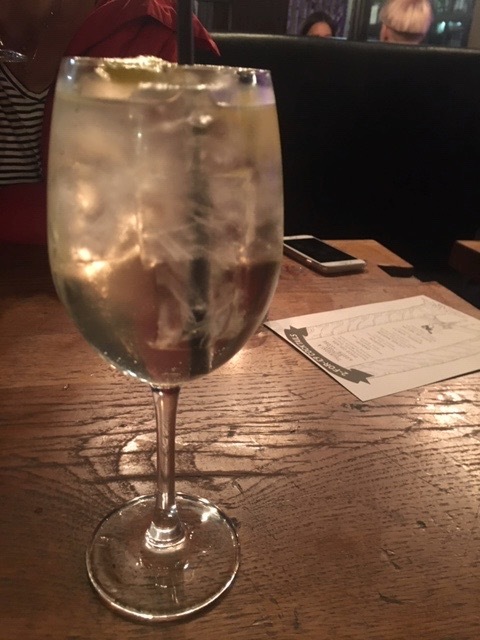 The Premium Ginger Beer is a cloudy white in colour. The label states that this drink has a blend of ginger roots, and again with the botanical flavours. There was a decent fizz on opening the bottle, only this time I could smell a heady blend of ginger root. It almost made me sneeze. I had a feeling I was going to like this drink. On taste this is a completely different drink to the Premium Ginger Ale. All subtlety is out of the window. There is oodles of ginger root in this drink. It jumps out of the drink as you take a swig and slaps you around the face screaming "ginger". I must admit I got a pretty runny nose from drinking this Premium Ginger Beer. They could definitely put 'fiery' in front of the ginger beer on the label. Not too sweet in flavour, the botanicals take a back seat in this drink, and the ginger root is very much full throttle. As you've probably guessed, this was my favourite of the two. Premium Ginger Beer for the win! Just a quick one with a bit of news here, I was on the Ocado website and looking into new flavours of crisps. At the end of my trawl of new products I spotted some very interesting, not yet available, flavours. 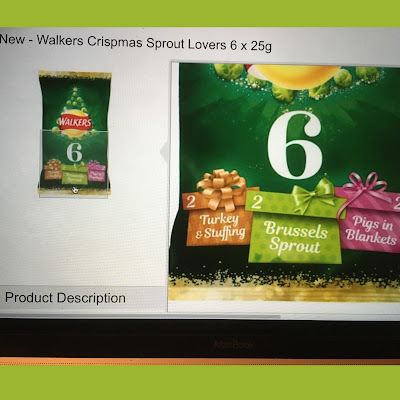 There seems to be two new multipacks coming, one for Sprout Lovers and one for Sprout haters! The Sprout Lovers crisps does include a Brussels sprouts flavour, which I can’t wait to get my hands on! The clear conclusion from this that everyone loves Turkey and Stuffing! I’ve been to a meeting in Stoke today with work. As it was lunch time when I finished I decided to look for something to eat and drink on my way back. 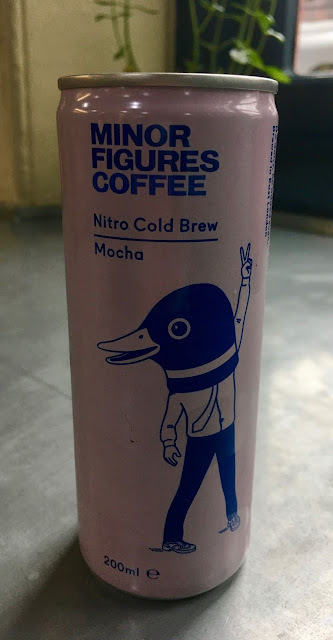 I spotted a tasty looking salt beef and pickle sandwich at Stoke Station and also on the shelf was this Minor Figures Coffee - Nitro Cold Brew Mocha. The nitro part refers to the fact that this coffee is cold brewed slowly in its preparation. Also it might go part of the way to explaining the penguin headed man on the tin, but not completely. The can was pretty smart and modern to be fair so it got my attention. I opened up the can and gave it a sip, the taste wasn’t what I’d been expecting. The flavour had some mild coffee and a hint of sweetness from the chocolate and a very much in your face oat flavour that was almost nutty in taste. It was so strong I checked the ingredients and only then realised this was a dairy free drink made with oat milk. The flavour didn’t hide this, but the oat milk wasn’t clear from the front of the can. I assume if you avoid dairy you might just know from the brand, but it surprised me. It also has no added sugar and uses Stevia instead which is still plant based. Once I got used to the flavour it grew on me, it was still creamy from the oat flavour. 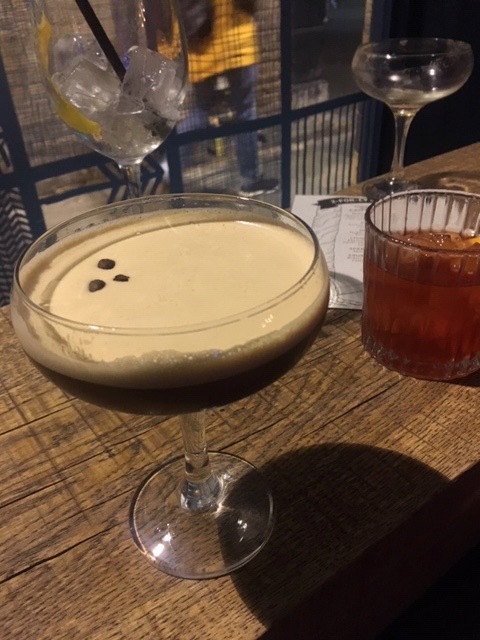 For me I would want coffee and chocolate to be the dominant taste in a mocha, even a dairy free one, so this didn't hit the nail on the head even though it was quite pleasant.